JNN 15 Sept 2014 London : A 20-year-old Scotswoman who abandoned her family to join the Islamic State of Iraq and Syria has rejected pleas from her parents to return home, saying she would only come back to raise the ISIS flag over Britain. 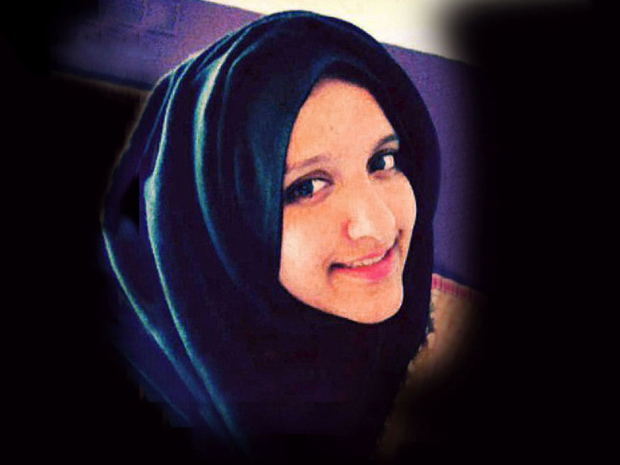 Aqsa Mahmood has reportedly skipped university and left her family in Glasgow to flee to Syria since November last year. She got married a few months later to an ISIS fighter, according to the Daily Mail. A week after her parents held a news conference asking her to return home, Mahmood said Thursday she would not come back anytime soon. Speaking on the anniversary of Sept. 11, 2001, attacks, Mahmood said on a blogging website: “The only time we will ever, ever return to those lands beithnillah [God willing] is to raise our flag,” reported the Daily Mail. “My dear brothers and sisters who are stuck in the west and restrained due to the kufr [infidel] governments know that indeed the help of Allah is always near, have Sabr [patience] and know that you will never be tested beyond your ability. The parents of Aqsa, Khalida Mahmood and Muzaffar Mahmood, begged their daughter to return home in a conference held last week. “You have betrayed us, our community and the people of Scotland when you took this step,” they said. The 20-year-old daughter was apparently in touch with her parents through social media since she left to Syria in November. She later suspended her Twitter account after British newspapers reported her involvement with ISIS last Tuesday. “The family you get in exchange for leaving the ones behind are like the pearl in comparison to the Shell you threw away into the foam of the sea,” she said as quoted by the British daily. She then addresses U.S. President Barack Obama and British Prime Minister David Cameron, saying the battle of ISIS will transcend to the West. “Know this Cameron/Obama, you and your countries will be beneath our feet and your Kufr [infidel] will be destroyed, this is a promise from Allah swt that we have no doubt over. “If not you then your grandchildren or their grandchildren. But worry not, somewhere along the line your blood will be spilled by our cubs in Dawlah [state]. This entry was posted in Europe and tagged Aqsa Mehmood, ISIS, Islamic State of Iraq, Khalida Mahmood, mahmood, Muzaffar Mahmood, Scotish Woman, Syria. Bookmark the permalink. SEE HOW POLITICS IS SUCH A FILTH THAT DUE TO INTERNAL DIFFERENCES PEOPLE REBEL AND JOIN THE MOST RABID ABSURD ORGANISATION OF TERROR , VIOLENCE ,KILLING AND HATRED . I WONDER HOW SUCH A PRETTY LASS, WHO MUST BE EDUCATED AND FROM A GOOD FAMILY SHOULD BECOME THE ENEMY OF HER OWN COUNTRY AND KNOWING WELL THAT IT WILL LEAD TO A VERY TRAGIC END AND A STILL MORE CHATISING HEREAFTER , SHE IS UNFIRLING THE FLAG OF HATRED AND BLOOD . MISFORTUNE IS FOR THE PARENTS WHO PRODUCED AND NURTURED A DERAILED DAUGHTER WHO SHALL BE BLOT TO THEIR NAME AND REPUTATION . PARENTS EVERY WHERE AND IN EVER COUNTRY BEWARE , PARTICULARLY AT THE FORMATIVE STAGE OF YOUR CHILDREN .